The league rules boil down to a minimum of 6 rounds of weekly entries, each entry consisting of a team of at least 5 minis, with the top 8 contestants after the sixth round going forward in knock-out round until the top three are decided. The first two entries need to be “new” meaning no images have been posted of said minis anywhere before. Each round, the contestants are to enter a single picture of a team (at least 5 models, they need to be “on the same side”). What models etc is up to the painter. Rounds 1 and 4 however have an optional theme; bonus points are awarded if the entry fits the theme. For those moving forward into the knockout rounds, round 7 has a compulsory “historical explorers or pioneers” theme. Bonus points from round 3 onwards are also awarded if the miniatures are “new”. Each round two entries are paired off, and forum members get one vote in each pair. The amount of votes cast decide the winner of the pairing, and the difference in votes between the two is the basis for extra points. For round 1, the theme was “British” in celebration of the forum’s recent move to a new home in Britain from it’s original home in Germany. Round four has a “support weapon (non vehicle)” theme. At any rate, as per the rules of the league, it is not permitted to post any pictures of a given entry during the round it is entered. Brass tacks: no pictures or mention of my entries anywhere else until the round’s voting is done and the next round started. Now, since the first round is over, I can post images of my first entry. I do not have any historical miniatures, and I did not really have any specifically British either. I do have a few Imperial miniatures from Warzone, but not enough to build a team. 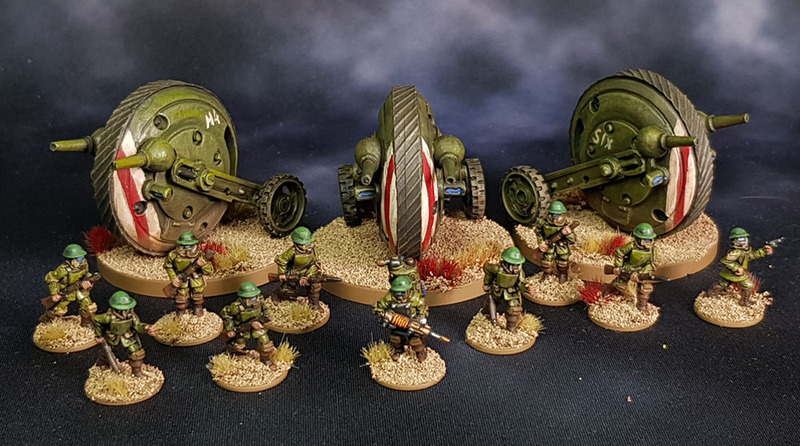 But then it dawned on me, I do have some 15mm British models for the WW1 Weird War game All Quiet on the Martian Front that have been languishing in my Mountains of Minis. When the creator Alien Dungeon went bust and never delivered the remainder, it was a major downer. I lost interest and packed them away. 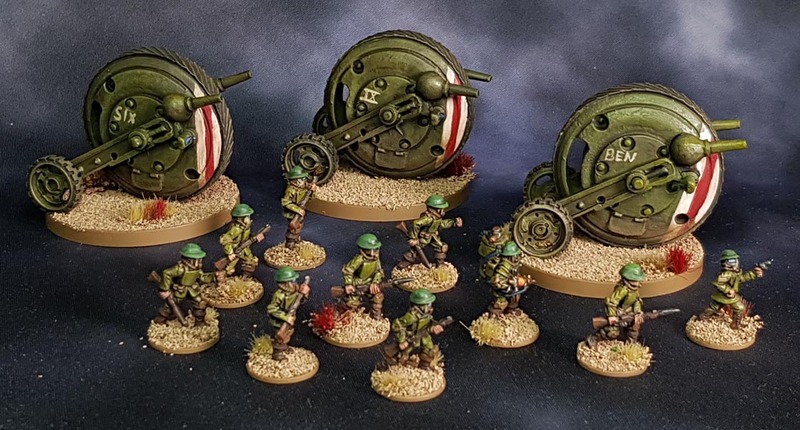 These are “British Infantry” and “Monotank” -miniatures from the “British Expeditionary Force” faction. And it is certainly a departure for me, isn’t it? 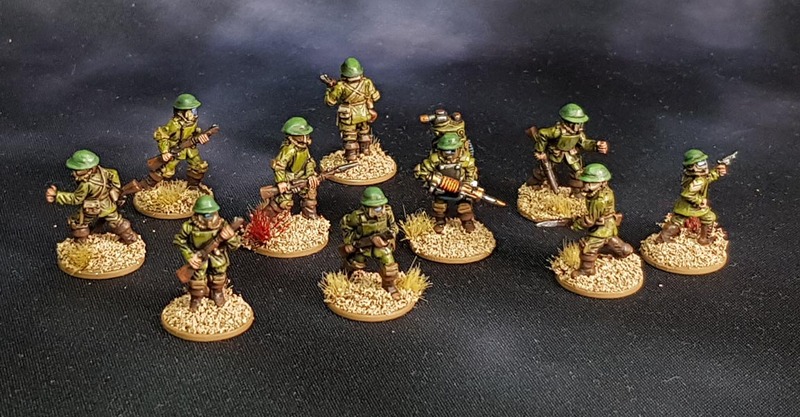 I find that such competition, leagues and forum challenges really help to motivate me to get other miniatures than I normally paint done, as these minis are a very good example of. They would probably have languished indefinately in my Mountains of Minis where it not for this league. At any rate, the round went exceedingly well, I was quite pleasantly surprised to discover I am third place on the leaderboard after the first round! Hoody-Hoo! The wheel-body is resin, the training-wheels and guns are metal. The infantry are metal, I have mounted them individually on ancient Norwegian 10 øre-coins, that are 15mm in diameter and perfectly weighted for this. The monotanks needed basing as they were very prone to keeling over, much like I imagine they would be if they existed as actual tanks. For the game the infantry are supposed to be mounted on 10x2cm strips, so I have been working on 3D-modelling such a strip with matching indentations, much like a miniature movement tray.